The sky over Tegucigalpa was filled with smoke on Tuesday afternoon outside the headquarters of the Autonomous University of Honduras (UNAH). The students, outraged by the fraudulent election of President Juan Orlando Hernández, gathered at noon to hold an assembly inside the university. As soon as they took to the streets, there was a confrontation with the police. The tallying and transmission of voting results from the November 24 general elections continue, but so do widespread reports of fraud and intimidation throughout Honduras. Two political parties are not recognizing the results, announcing challenges in the courts and in the streets. “They don’t want an example to be set in Honduras where the people kick the oligarchy out at the ballot box and where the system changes in favor of the people,” said Libre party activist Nelson Orestes Canales Vásquez. 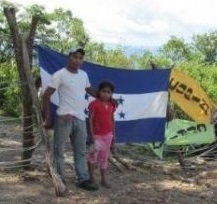 “Our people have awakened, and we’re not going to give in to those who want take away what is ours as indigenous Lenca people,” said Francisco Sanchez Garcia, President of the Indigenous Council of the Council of Indigenous and Popular Organization of Honduras (COPINH). The judges in the Criminal Division of the Supreme Court of Justice of Honduras rendered their decision on Novemeber 5 in the case of Jose Isabel “Chavelo” Morales, partially siding with his lawyers’ appeal. The judges annulled the conviction and the 20-year sentence and they ordered that he be released from prison, but they have returned the case to the lower court in Trujillo for retrial. Most significantly, Chavelo can remain free during this new process. 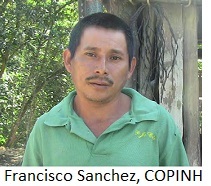 In the months leading up to the first national elections since the 2009 coup in which members of the Resistance movement will participate, state-led terror and the criminalization of social protest have intensified.The terrorizing of activists like Edwin Espinal falls within the context of criminalization of social movement leaders like Berta Cáceres and Magdalena Morales. It is also part of a recent pattern of apparently politically-motivated military police-led home invasions. Honduran authorities want Berta Cáceres in prison. Even more, they want her dead. 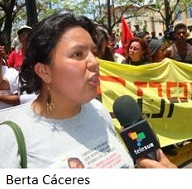 Cáceres is a founder of the National Council of Popular and Indigenous Organizations of Honduras, and she went into hiding on September 20. But against all odds, Berta Cáceres is still alive. The new military police are better armed than the civilian police they will replace in this mission. For example, they will be armed with Israeli Galil ACE 21 assault rifles carrying 35-round magazines, capable of firing 700 rounds per minute. The prospect of these boots on the ground treating neighborhoods in Tegucigalpa and San Pedro Sula as battlefields should be troubling, even to those who applaud this latest move in the name of increasing security, including the US State Department, which Liberal party congress member Jose Azcona said in July had encouraged the formation of such a force during the previous presidential administration.